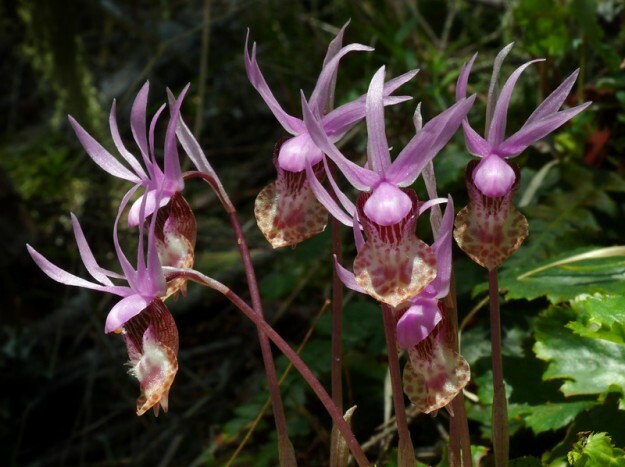 Who can resist photographing such a beautiful clump of fairy slippers (Calypso bulbosa)! On our last trip to Eagles Rest, 15 days earlier (see Early But Lovely at Eagles Rest), Sabine and I were excited about the multitudes of Fritillaria affinis buds. 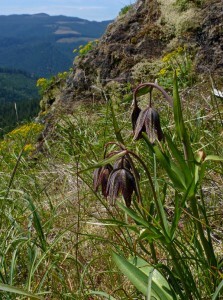 I didn’t want to miss what looked to be a fabulous bloom, so yesterday (May 20) we headed back up there. The most striking thing we noticed is how little had changed in two weeks. Upon entering the woods, the carpet of trilliums was still there, with only a few showing signs of their petals fading to pale pink. The snow queen was also still blooming well, but there were far fewer violets. There were still oodles of gorgeous fairy slippers there and farther along the trail, and they were still in perfect bloom. They were even more profuse in the woods up near the summit, some of which were only in bud before. Usually they grow scattered about, but we saw two tight clumps each with seven blossoms. After viewing at least a few hundred flowers, we noticed we never saw a single pollinator visiting them. I’ve read several times about how they fool bees into pollinating them without giving a reward of nectar or pollen. But in all the years of admiring and photographing these stunning flowers, I can’t remember ever seeing any bees or other insects show any interest in them. 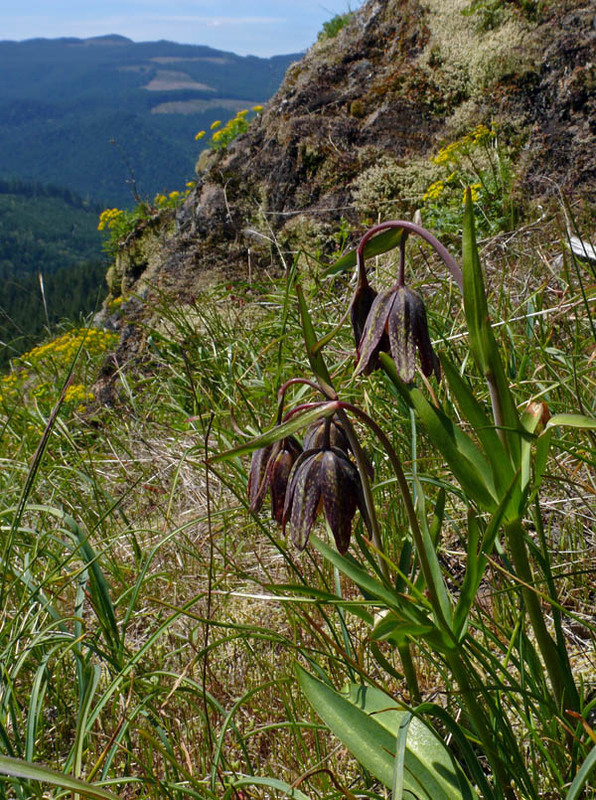 Fritillaria affinis, known variously as mission bells, chocolate lily, or rice root. Just like last year, the cool, damp days are causing spring to slow down to a crawl. While we did find some fritillaries in bloom, many were still in bud, and sadly, many more were missing their buds. Apparently, they are a delicacy to some animal, most likely deer. With amazing precision, they were carefully picked off leaving the leaves and even the flower stalks untouched. While we didn’t see any deer, we did spot some other wildlife including a very small skink—his blue tail about all there was to him—and a bright green tree frog. We also saw a sheep moth and had glimpses of a duskywing and a blue. The butterflies are really having a terrible time getting going this spring. Some new things were popping up, and I was able to add a number of common things to my list that were just leafing out or coming into bloom. One change was my tentative identification last trip of Romanzoffia sitchensis on the north side cliffs below the summit. I found a safe way to get down to where some were growing to view them up close, and sadly they were not R. sitchensis but rather the more common R. californica. I should not have jumped to a conclusion based on viewing foliage with binoculars and someone else’s old list. But that’s why I always try to make an effort to double check. It always seems we find something new no matter how many times we revisit a site. The one interesting discovery we made on this trip was a number of naked broomrape (Orobanche uniflora) just popping up and coming into bloom. The presence of their perky purple flowers was no surprise, it was where they were growing that really fascinated us. 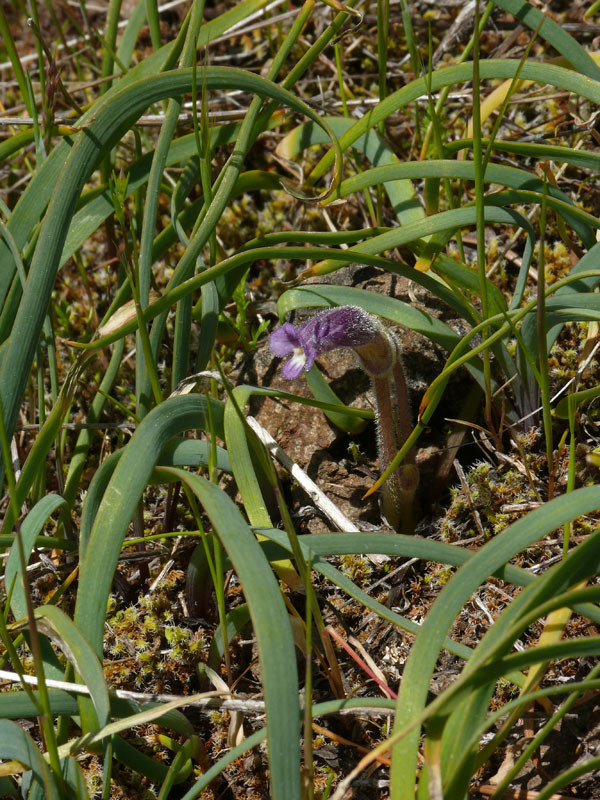 Broomrapes (Orobanche spp.) are parasitic and known to be fairly specific about their host species. This species is commonly found in sedums and saxifrages. I most often see it growing in patches of Sedum spathulifolium or peeking out from colonies of Micranthes (Saxifraga) rufidula or M. integrifolia (that’s where they grow on my property). Sabine says they are common in the Gorge growing with prairie star (Lithophragma spp. ), another member of the Saxifrage family. That’s what they grow with on Tire Mountain. Here, however, they were clearly growing in association with Olympic (also known as scalloped) onion (Allium crenulatum). I’ve never seen or read about that before. We wandered all over the areas just below the summit where there were onions coming up. Once we got the search image down and realized the little broomrapes were easier to see on our hands and knees, we found many in bud along with some open flowers. About the only other thing growing in these dense patches of onion was the very weedy composite, spotted cat’s ear (Hypochaeris radicata) and some grasses—no sedums or saxifrages for quite a ways. Dr. Ken Chambers and I have discussed Orobanche host plants several times. He told me that most of the specimens in the OSU Herbarium were collected without the host plant, so there is much we don’t know about these parasitic plants, and more documentation is needed. Just because it is growing in proximity to another plant does not mean it is using that plant as a host. Since this association seemed unusual and both plants were abundant, I dug a small patch up* to see if I could find the connection. At home, I carefully shook off and washed off the dirt. Alas, although the roots were all tangled together, they were not attached—at least after my “surgery”. Their roots looked so similar, I could not tell if the attachment was still evident. Oh well. I went ahead and pressed the Orobanche anyway to give to the Herbarium. The flowers are variable and may be of some interest. Maybe next time I’ll have more luck. *Please do not dig plants without permission. I request and receive a permit from the Forest Service each year to collect for scientific purposes. I only collect things that I believe are of scientific interest or that another botanist has requested I collect for their research. And I never dig up anything unless the population is large enough to handle a small loss. In many cases, a branch or inflorescence is enough to show the interesting characteristics. Obviously, digging is required with Orobanche since the root attachment is the most important feature.